2014 is a pivot year for digital. I’m not a headline-grabbing kind of guy. So when I say this, I mean it. This is the year that digital can go from a high-return, extremely effective 25% of client—by ‘client’ I mean agency clients or the companies for which in-house marketers work— marketing budgets to an even more profitable 30%, or even 60%. That will mean higher profits and revenue, better client relations and happier customers. It will mean better reviews for us, and longer tenure. Digital agencies can be heroes, for once. Digital is more transparent to leadership, more measurable and more agile than most traditional media. So why does it account for only 25% of client budgets? Why are we always agency #2, hired by agency #1 (the traditional agency), with agency #1 managing creative direction? Because digital feels neither safe nor creative. Transparency isn’t so great when ‘measurable’ means that failure is immediately and painfully apparent. And it’s hard to be creative when your entire marketing plan is a spreadsheet. In traditional media, your client can’t dissect the 50% that fails. In digital, one look at the data can drive months of second-guessing: Why did you buy the display ad that generated -5% ROI, when this other one generated +200% ROI? The answer, of course, is that you didn’t know. You couldn’t know, until you tested. Testing means you get some wrong. Getting some wrong means you’re fallible. But the data that comes with digital creates an aura of infallibility. So, here we are. We all know we might get fired for spending $250,000 on a banner ad, but we’ll rarely get fired for running a $250,000 print ad. And we know we can do some brilliant creative, but we never do. Digital remains 25% of our clients’ budgets. Mobile. We’re past QR codes. Apps and web sites can detect location and deliver content based on that data. This year, smartphones will become devices we rarely use as phones. Instead, they’ll be our mobile control panel. The internet of things is emerging as a reality. Search engines and social networks are better than ever at connecting ideas with ideas, instead of links. Digital marketing has become digital spreadsheet management. I’m a data nerd, so I know how addicted we marketers have become to reams of data. But I’m also a marketer. I know that, even if I had every data-driven detail of my audience, that data still wouldn’t create a resonant message. Our customers aren’t algorithms. So algorithms won’t compel them. Data can guide, but it can’t drive. Set expectations with your clients, from the start: Yes, you’re great with the data. Yes, you provide lots of reports. But you also bring the insight and creativity of a marketer, which means we’ll deliver far more value. And any client, large or small, can appreciate that, if we make it clear from the start. In traditional marketing, we have no control over infrastructure. We deliver our ad to the publisher, or the TV station, or the radio station. They present it to the audience using their tools and channels. In the digital space, though, we control much of the infrastructure. At least, we should. If the web site fails, our ad buy is wasted. If the banner ad crashes 1/3 of all web browsers, we lose 1/3 of the audience. It still shocks me how few digital agencies have true in-house web geeks. That leaves them dependent on outsourcing or their clients’ IT teams. Neither leads to good outcomes. Get your own technologist. They can do the work, or they can work for your clients. Either way, you need that expertise on your team. The client’s IT team has to focus on security, stability and other priorities. You need someone 100% focused on you and your clients’ needs as marketers. So get that technologist. Coca-Cola’s web site crashed after a 2012 Super Bowl ad drove scads of traffic to their site. Acura’s did, too. I don’t know which agencies built those sites, but a technologist, on their team, pushing for site performance, might have helped and saved them millions in lost revenue. This matters even more for small businesses. You must be able to help them judge good from bad. You can’t do that if you don’t know the infrastructure. Go one entire year without saying “content marketing.” Instead, return to the assumption that content is marketing. Make a clear message and valuable information the guiding principle of any campaign. This isn’t idealism. It’s how the best marketing has always worked. The best marketing always makes the best stories. 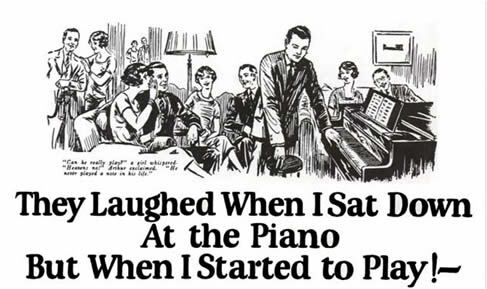 John Caples’ classic “They Laughed When I Sat Down At The Piano. But When I Started to Play…!” shows this has worked for almost a century. Tell a great story with great content. Sell your clients on it. Don’t give in to the “We need 10 articles for $50 each” mentality. It’s tempting, but it fails, and it doesn’t make you any money, either. $50/article? Really? What exactly is your margin on a $50 article? How many do you have to write to pay the bills? Take the high ground. Make content the place where you start to show creative prowess. You’ll be surprised how many clients come around. We have a tendency to dive into the latest thing at the expense of all others. I’m saying we shouldn’t let data lead—I’m not saying we should ignore it. It’s still a fantastic tool. Don’t forget about it. Finally, if you want it all to come together — if you want 2014 to be the most successful year you’ve had yet—don’t try to replace traditional with digital. Put them together, and show your clients why no one’s better qualified to do it than us. Take traditional and digital marketing out of their silos and coordinate them. You don’t need technical wizardry like location-awareness (although it doesn’t hurt). You do need clear audience cues, presented when the audience has a smartphone in their hand, or a TV nearby, or a magazine in their lap. Zappos does this by placing ads in those NSA security trays that hold our shoes at checkpoints. We’re thinking about shoes, right then. They know it. We see it. We remember. Brilliant, effective and creative. No technology required. Think environment first, technology second. Whether you work with the Fortune 500 or 50,000, there are great opportunities out there for omnichannel strategies and tactics. Learn to measure this kind of marketing, too. It is possible to measure cross-channel impact. Learn how! This is the most important bit of data we have, but we tend to ignore it. We’re all marketers. We work in-house and at agencies. We compete with each other. So why work on something like this when we can undercut each other and get more business? Because, if we all aim high, we can increase digital’s share of budget. That makes us all more money. It also better serves our clients. And it delivers great value to clients’ customers when they need it. It’s not often we get to take the high road, do cool work and profit at the same time. I say we enjoy it. Help make 2014 the real Year of Digital Marketing. Real good stuff here Ian. The writing is certainly on the wall. With the new updates forcing low quality crap out of the way, new technology breeding infinite techniques, and an increasingly aware client, we should all be able to make significant headway in 2014. Awesome article — thank you! I am so excited about our new DTC president, who I hope will bring us (kicking and screaming) into the Digital 21st Century. Maybe we’ll even get to hire an outstanding outfit like Portent. Hey Ian. I like where your head’s at. We’ve learned a lot this year with what we tried (and also failed) with integrated marketing. I’m appreciative of the lessons so that we can move into 2014 with some contrast and direction. 1) Not letting budgets drive our creativity. Really creative stuff doesn’t require big budgets. It requires diligence and perspective. It’s always the simplest of things that make the biggest difference and that people remember. To me, creativity is when you can look at a $1mil piece of marketing and figure out how you make something like that work for your $5,000 budget. 2) Slowing down to speed up. We are incredibly lucky to have so many powerful tools to work with in digital marketing, but it’s easy to get caught up in the hype and bustle and forget that it’s not about frequency it’s about quality and ingenuity (and people). We’re going to take more action and we’re going to try and get out of our own way. And most importantly, we’re going to do our best to block out the noise and create strategic “content” (in whatever form that comes) that really makes a difference. We see the immense potential that 2014 has in store for us and we’ve got some things planned. Would love it if they involved collaboration with your super clever team. #1 is particularly crucial. If inspiration hits, go with it. #2 was a lesson that took me years to learn. Don’t just dive in in a panic. Take an hour. Stop. Breathe. Plan. THEN panic. Thanks, Mack – great comment as always. Ian, You make the ultimate point that data provides the means to discover how, why, where and when our digital messages should go. These seldom go far based solely on data …. it’s in the execution and implementation of that discovery that determines the winners and losers. 2013 emerged as really the first time that the offline and online worlds are converging to the point that “the second screen” is not just talked about it’s happening as we see twitter streams in television shows. The CBC here in Canada also have “second screen” set up for the Saturday night hockey games. Digital and traditional are converging headlong into a scenario where to do it right may require the ability to mash up content that works simultaneously across both traditional and digital media! c) people change workplace quite frequently in marketing: if we are seen as an “enabler” partner they will try to involve us in future projects. Of course training has to be tailored to specific needs: we do low level seo training for ITs and keyword research and web analytics for marketing people. Couldn’t agree more with your thinking here Ian. I am very excited for 2014 and the challenges/opportunities it will bring to us on the agency side.